Let me take you around and around the cycle of Grandmother Moon, so that you may begin to know her as she lives within you. Ideally, we begin with Grandmother at her brightest and most open: the full Moon. This is a time of outward activity and high energy. If you sleep where the moonlight touches you, you will often find yourself quite wide-eyed until very late on these magnificent, luminous nights. It is a joy to walk outside where there are no artificial lights, so that you can actually see how bright Grandmother’s light makes the world at this time. Magic seems to touch everything as the silver light shimmers upon it. The Grandmother begins to cover her face, and gently to withdraw. This is the waning Moon, growing smaller and smaller in the night sky. In our Moon practice, we women as well can begin to withdraw into a quieter and quieter place, becoming less outward and social. We move toward an inward place that has more to do with “being” than “doing.” As the dark of the Moon comes, we are at our most inward place. If we are in cycle with the Moon, this will be the time our menses begin – a time referred to as our “Moon time.” To have our bodily cycle synchronized with the Moon’s cycle, we must be able to see the Moon so that Grandmother’s light can trigger that cycle within us. As you know, light is what triggers many of our rhythms on Earth, including the migrating of birds, nest building, and other instinctive behaviour. We, too, are profoundly moved by the light, yet with so much artificial light influencing us, it is more difficult to perceive these natural cycles. In the dark of the Moon, as we begin our bleeding, is the time when the veil between us and the Great Mystery is the thinnest. It is the most feminine, receptive time for women, and its function is exactly that: to be receptive. This Moon time then becomes a time of retreat and calling for vision. If we women are to use ourselves well at this time, then we still ourselves to receive visions, dreams, intuitions, and other left-sided messages. Native grandmothers teach us that this time is never used for ourselves alone; it is always used to pray for All Our Relations. Praying and asking for things for ourselves is important and appropriate, but not at this time. When we are in this place of being most receptive, we must never limit what we can receive by focusing only upon ourselves. Grandmother Moon has completely covered her face, and so can we. At this time, then, a traditional woman goes to a Moon Lodge, a place of quiet and beauty separate from the activity of daily life. This becomes her questing place, a place of protection and nurturing in contrast to the high precipices of other kinds of vision quests. During the days of her bleeding, she has the joy of doing nothing. She is not required to cook, to clean, to take care of others, to go to a job, or any other activity. Her sole purpose is to call vision for her people: to open herself to whatever the Great Spirit wishes to send through her to serve her family, her community, her world. She could receive something as simple as a new recipe to nourish her family, or a design for a rug she will weave for her home, or as grand as a call to create a national campaign for abused children or a city-wide recycling effort. Coming out of this dark Moon time, she has cleansed her body, nurtured herself with quiet and beauty, and received her visions. And now, Grandmother begins to uncover her face. As the tiny slice of new Moon waxes fuller and fuller, the woman comes back out into the world, carrying her vision. 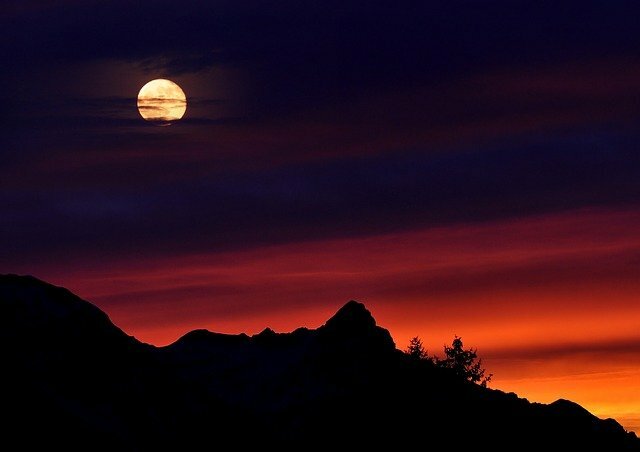 Then as the full Moon comes again, in the time of highest activity, she is at her most yang – working actively to make that vision real in the world. She may be talking with others, giving speeches, or simply busy in her kitchen or at her loom. This is the time of manifesting what she has been given on her inward quest. Buffalo Woman Comes Singing: The Spirit Song of a Rainbow Medicine Woman, p. 327-328. By Brooke Medicine Eagle.